Go on an adventurous deep sea fishing in this IGT’s Highliner video slot game. This is an attractive ocean theme features gorgeous artwork and has 2 valuable bonuses. 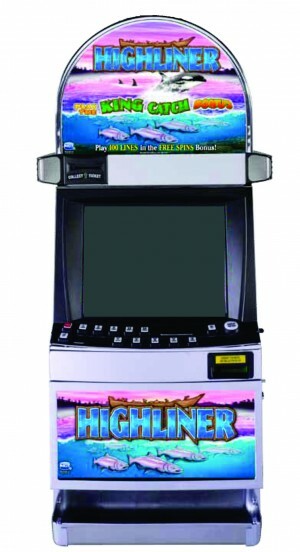 This game has the top award being 500,000 credits with 5 Highliner symbols shown on each of the 5 reels on a betted payline with the maximum of 50 credits per line. Scatter symbols are also awarded when 3 Wild are shown in any position on the 5 reels. There are 2 bonus games; the first is the Free Spin Bonus Game. This is initiated when three Highliner Bonus symbols are shown on a played payline. Five free spins are awarded to the slot player for each initiating line. Free spins are played automatically on 100 lines using the same bet per line as the initiating game. Free spin wins are paid from the bonus paytable. Free spins can be re-initiated within free spins by three Highliner Bonus symbols appearing on a played line. Upon re-initiation 5 additional free spins are awarded for each re-initiating line. The bonus ends when there is no more free spins remain or after 325 free spins have been played. All of the credits awarded to the slot player from the bonus game are added to the amount credits before the bonus game had begun. The second bonus is the King Catch Bonus. This is initiated when 3 scattered Salmon symbols are in any position on reels 3, 4, and 5 in the base game or in the Free Spin Bonus Game. Each of the initiating jewelry box symbols is assigned a value and a multiplier. The slot player selects one of the initiating symbols. The selected symbol reveals its pay amount which is immediately replaced by a multiplier. The pay amounts of the two unselected symbols are revealed. The sum of the pays of the two unselected symbols is multiplied by the multiplier of the selected symbol and the bonus ends. All wins are multiplied by the total bet on the initiating game. All of the credits awarded to the slot player from the bonus game are added to the amount credits before the bonus game had begun.